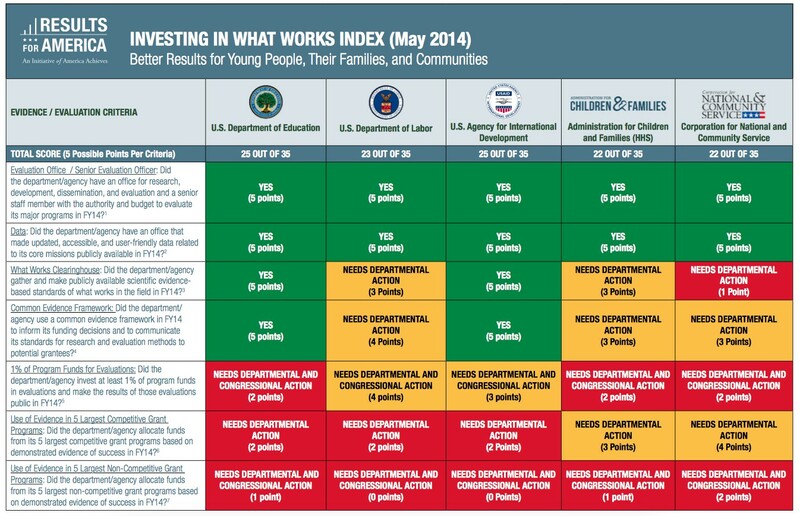 Results for America’s third “Invest in What Works Federal Index” highlights the extent to which the U.S. Department of Education; U.S. Department of Labor; Administration for Children and Families (within HHS); U.S. Agency for International Development; and the Corporation for National and Community Service are currently building the infrastructure necessary to use evidence and evaluation in budget, policy, and management decisions. This index assesses five federal departments and agencies against seven evidence and evaluation criteria. Each criteria is equally weighted and scored on a scale of 0-5 resulting in a total possible score of 35 points. Federal departments and agencies were given one point if they have demonstrated an intent to meet the stated criteria; two points if they have demonstrated some initial internal progress toward meeting the criteria; three points if they have made some initial public progress toward meeting the criteria; four points if they have made some meaningful public progress toward meeting the criteria; and five points if they have fully and successfully met the criteria. These scores are based on the information and links provided by these five departments and agencies. Results for America intends to update and expand this index on a regular basis moving forward. Results for America 2014 Convening: "What Next Steps are Required to Get Government to Play Moneyball?"